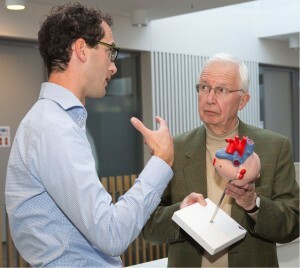 How does it feel to describe the Xeltis technology to a Nobel Prize Laureate? Watch Xeltis CTO Martijn Cox talking to Professor Jean-Marie Lehn, recipient of the Nobel Prize in Chemistry in 1987, during his recent visit to the Xeltis office in Eindhoven, NL. Professor Lehn is recognized as a pioneer in supramolecular chemistry, the science at the foundation of Xeltis’ technology and one of Xeltis’ scientific advisors. Professor Bert Meijer, another global leading expert in supramolecular chemistry and the brain behind the supramolecular platform Xeltis is using today, also featured in the video.